The Grand Harbour Marina of Malta is the result of co-operation between Maltese entrepreneurs and the well-known company Camper & Nichilson Marina Ltd, for an operation requiring a total investment of 4,000,000 Maltese liras. 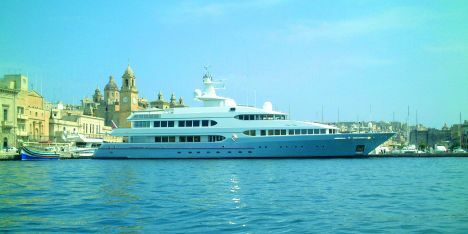 The capacity of the Maltese marina is currently 214 boats up to 25 metres long plus 33 berths for moorings for super-yachts up to 100 metres in length, all equipped with power utilities, water and full and efficient quayside services, in addition to numerous state-of-the-art technical solutions for providing comfort for the owners and their guests. During the stages of design and construction of the Malta harbour facility, special attention was paid to safety. As a result, each pontoon has its own modern fire-fighting system capable of tackling any type of emergency. In addition to water and electricity, most of the berths can provide telephone connections and to the web, as well as to a centralised TV system. The area accommodating the boats is covered by a surveillance service 24 hours a day and there is also a CCTV system for monitoring the quays, controlled by the surveillance personnel who are always present at the facility. Environment-friendliness was another issue dear to those who invested large sums in order to create a welcoming and safe landing place. A system for collecting sewage and waste water is therefore operational inside the Grand Harbour Marina as well as systems for preventing spillage of hydrocarbons into the sea while refuelling. All this is able to ensure that the quality of the water can be likened to the open sea and is also guaranteed by a recirculation system designed specifically to prevent the stagnation of harmful substances for the environment. Over the last two years the urban area behind the harbour has undergone important restoration and repair work, and there are also shops, offices, agencies providing all sorts of services, bars, restaurants and tourist and supporting services useful for boats, whether just dropping in or here for a long stay. In addition to the tourism offering available on the island and to the quality services addressing leisure boating, Malta is an attractive port of call for Mediterranean cruises, thanks to its strategic position and its many links by air to the main European cities. Malta is definitely a great choice as a place of departure or arrival of a yacht cruise, enabling visits to places such as Sardinia, Corsica, the Côte d'Azur, the Balearic Islands and Croatia within less than two days' sailing. What is more, Corfù is only 370 nautical miles away, Tunis 222m and the furthest point of the Mediterranean does not exceed a distance of 1,000 nautical miles. Malta's geographical position places it at the top of the list of ideal Mediterranean bases for chartering activities, for yacht owners in general and for those of super-yachts, thanks to the presence of the Grand Harbour Marina and all its facilities. Malta also offers a high quality of life at accessible costs for crews and their families, which is an important point to consider if the island is chosen as a permanent base for a yacht. Both the administrative authorities of this Mediterranean island and the local entrepreneurs are investing heavily in leisure boating, as Grand Harbour Marina bears witness. 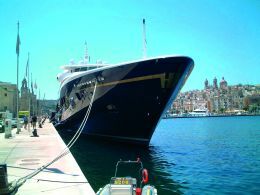 For further information you can contact the manager of the marina, Miss Anna Tabone, by calling number +356 21 800 900 or visit the web site www.ghm.com.mt.